Ah, your first days on Twitter. A time of innocence and serendipity. Look, your friend just made a witty joke about their burnt toast! And there — Oprah’s tweeting about her new favorite book! It’s like your favorite people are in your pocket talking to you, all the time. The future is wonderful. And then you notice that while there are a few choice nuggets of cleverness and utility, your Twitter stream is often bogged down by self-promotion (#humblebrag lol!) — or worse — someone’s tweet-by-tweet platitude marathon recounting a social media expert’s conference keynote. 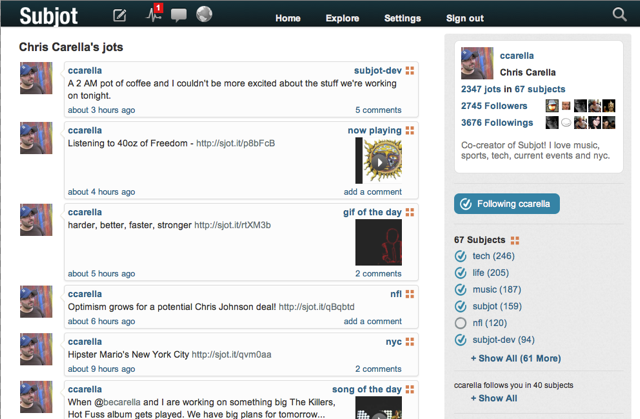 Subjot, a NYC-based startup that’s launching today to the public, might have the answer. It wants to help you connect with people you’re interested in, but only around the topics that you want to hear about. Say, for example, you wanted to follow all my Jots on technology, but you might not be so interested in my misadventures in learning how to cook. On Subjot, you could do that — you’d just check off the ‘Tech’ box next to my name, and you’d only see Jots that I’d labeled Tech. There isn’t much more to explain: it’s like Twitter, but broken down by subject. The site’s initial signup flow prompts you to connect with your Facebook and Twitter accounts, at which point you’re presented with a list of your friends already on Subjot, as well as the topics they’re Jotting about most frequently. If you’re good friends with someone or you find them especially interesting, you can opt to follow all of their Jots. Subjot was created by husband-and-wife team Chris Carella and Becky Carella, who first came up with the idea last December and began working on it full-time in February. Mr. Carella says their inspiration initially came from Quora — they noticed how interesting topic-specific Quora threads often became, but that they were restricted because they’re in a Q&A format. Subjot is looking to open that idea up a bit more. You can get a sense for what a Subjot stream looks like by checking out Chris’s stream here. (My significantly more irreverent stream is here). Some readers may be mentally pointing out that they could use hashtags on Twitter for a similar purpose: append a tag like #tech to your tweet, and it’ll show up in a timeline filled with other tech-related tweets. Of course, if you’ve ever actually tried to use hashtags for anything other than a punchline, you know that they fall apart quickly. For one, there are often many hashtags created around the same theme or event. And because running a query for a hashtag shows results for everyone on Twitter (rather than just your followers), the stream gets noisy fast and is rife with spammers. I’ve been using Subjot off and on for the last two weeks and think it’s promising. There are a few quirks — I find that navigating between users and topics isn’t always intuitive, but this may simply be because I’m used to Twitter (for example, clicking the ‘tech’ topic next to someone’s Jot takes me to all of their Jots about tech — you have to hit a different button to see everyone else’s Jots about that topic). There’s room for improvement in the UI, but it’s a good start. 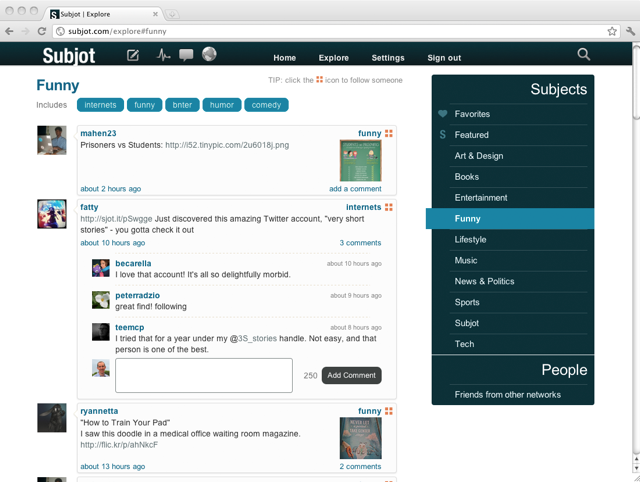 Of course, Subjot is going to have to deal with some of the same issues that Twitter has. The biggest one: getting people to tag each of their updates, and ensuring that those tags will actually be useful (as I used the site, I found myself asking if I should tag one of my Jots ‘tech’ or ‘technology’). Mr. Carella says this is something that he’s been thinking about since they first got started on the project. During the site’s private beta it hasn’t been a major issue — you see the tags your friends are using and use the same ones. But as the site scales they’re going to have to come up with some ways to address it, perhaps using autocompleted or suggested tags. Then again, those would be good issues to have. The site’s biggest challenge now will be to attract a sizable user base — building a social network is hard. But because Subjot is topic-based, in some ways it may actually have an easier time than your average Twitter competitor: your friends may not be on it yet, but it isn’t hard to find people who are talking about the things you’re interested in.